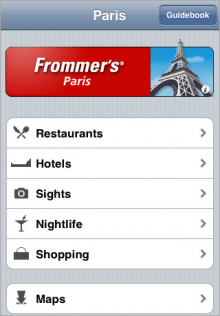 Frommer's announced today that they have released version of their popular travel guides to the iTunes App Store. The initial release includes 2008 editions of Frommer's New York [App Store], San Francisco [App Store], London [App Store] and Paris [App Store]. Each are available for $9.99. The fresh and innovative digital editions of the trusted print books will be locally stored on iPhones and the iPod Touch, allowing users to quickly browse ad-free content without an internet connection. Frommer's for iPhone features local travel tips, restaurant and hotel reviews, and bonus features such as location-based services, interactive maps, and web and phone links, all instantly accessible with the flick of a finger using the unique touchscreen interface. By having data stored directly on the iPhone itself, travelers can avoid accessing the internet which my invoke costly roaming data fees. Comparable paperback versions of the book cost $17.99 retail ($12.23 at Amazon)".